Born in Zurich, educated in Paris and lived in New York in the 1980s, Suzanne Syz is the definition of a delighted creative spirit. Collected by royals and celebrities around the world, her one-of-a-kind jewelry designs are inspired by fairy tales, travel, and indispensably, art and joy. Ever since her encounters with the art world’s legendary stars like Andy Warhol, Jean-Michel Basquiat and Jeff Koons, her lifelong passion for contemporary art has guided her and her husband to build a inspiring art collection. Suzanne Syz. Photo: Ezra Petronio. Courtesy of Suzanne Syz. I’ve always been attracted to art since my childhood. My father used to paint aquarelles in his free time and collected art. But it was in New York in the early 80’s that we really decided to collect. We were lucky enough to meet talented artists through our friend Bruno Bischofberger, such as Jean Michel Basquiat, Andy Warhol, Francesco Clemente and Julian Schnabel. Artists of “now” – living in the present and being surrounded by pieces that reflect today’s artistic movements. The First time I fell in love with a piece was in 1982 at the first exhibition of J.M. Basquiat in the cellar of Annina Nosei’s gallery in Soho. An “Indian Head”, brilliant!! 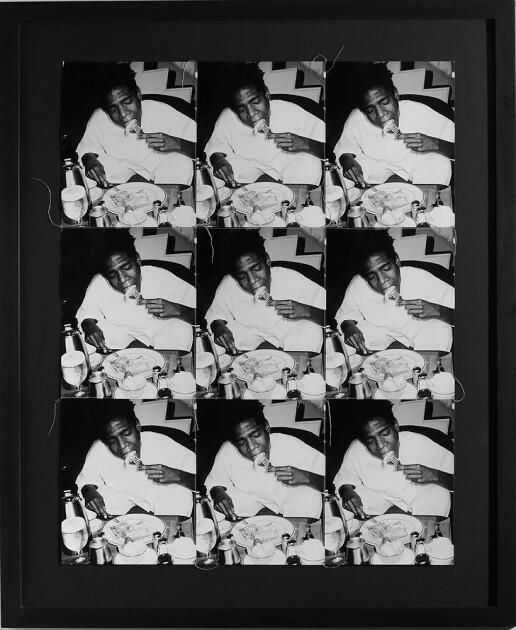 Andy Warhol, Jean Michel Basquiat Eating, 1976. Photo: Philippe Fragnière. Courtesy of Suzanne Syz. In general, our collecting goes mainly with emerging artists! Exceptions are Elaine Sturtevant and my dear artist friend John Armleder. 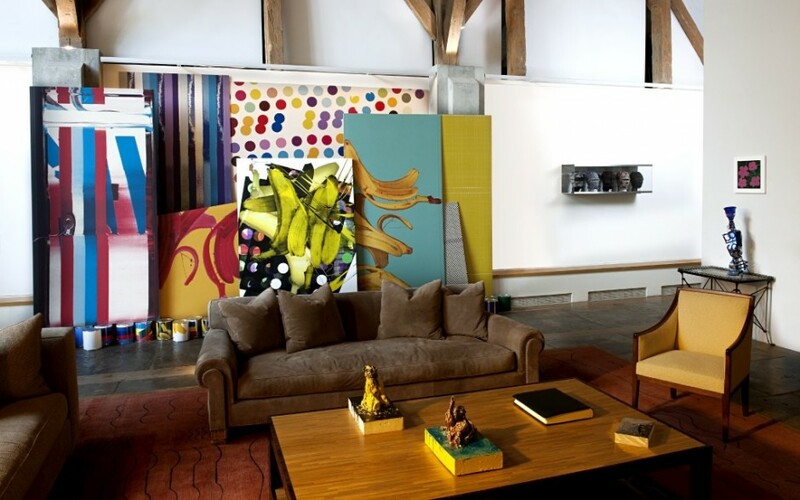 The Syz residence in Geneva with artworks by Elaine Sturtevant, GuytonWalker, Rosemarie Trockel and Thomas Schütte. The Syz Collection. I really buy what makes me vibrate. Some pieces are very powerful, others unconventional, or even disturbing such as “Fred the Frog rings the bell” by Martin Kippenberger, which is hung on the wall of my sitting room alongside others pieces. What was the first artwork you purchased? How many artworks do you own? Among the first ones was an aquarelle self-portrait by Francesco Clemente. The collection now has about 1200 pieces. Where do you display your collection? Part of it is in our bank in Geneva, in my office and houses; some are lent for international exhibitions; and others are in storage. But we like to live with the pieces, so none of them really stay in storage for long. There are exhibitions in Geneva to display your art collection publicly, how was the experience? We showed a small part of the collection at Art Genève last year, and it was a great success. We will also show about 14 pieces from our art collection at the Musée d’Art Contemporain in Geneva. 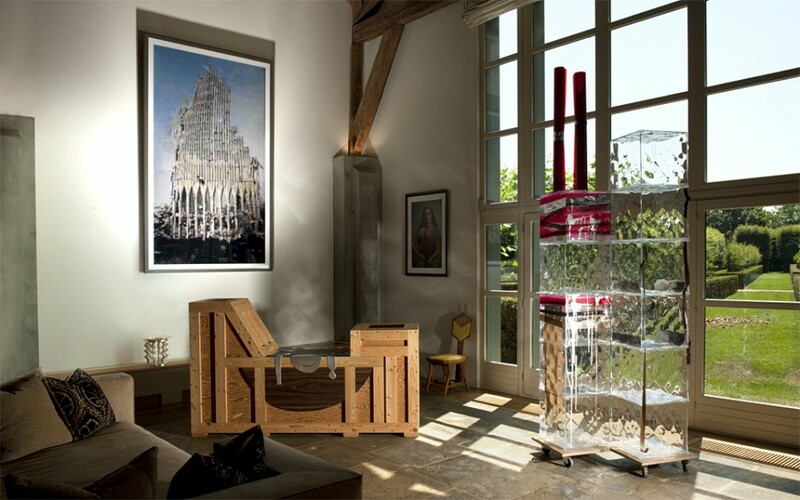 The Syz residence in Geneva with artworks by Cindy Sherman, Isa Genzken, Richard Artschwager and Thomas Ruff. The Syz Collection. It has to fit into the collection; and our curator Nicolas Trembley, my husband and myself have to agree to buy the piece! It is extremely important for me to meet the artists in person and also exciting to learn what inspire them! You are having Nicolas Trembley as the curator of your collection. How would you describe the cooperation/relations with him? Total harmony! Nicolas is a very valuable and trusted adviser. 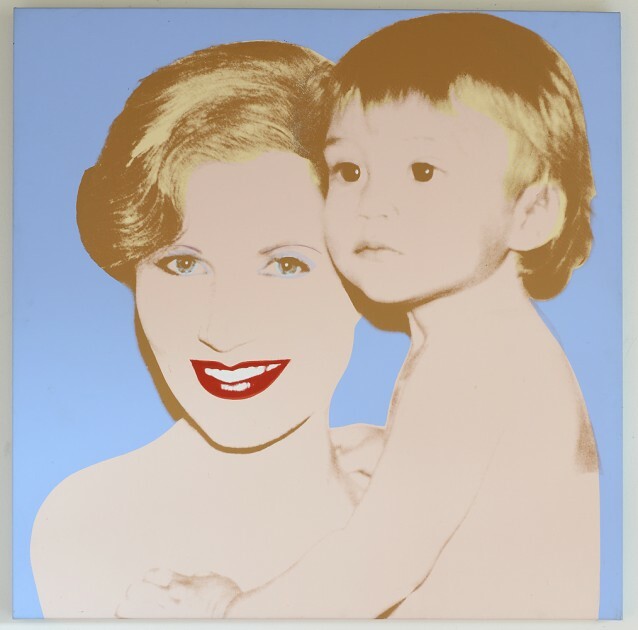 Andy Warhol, The portrait of Suzanne and Marc Syz, 1982. Photo: Philippe Fragnière. Courtesy of Suzanne Syz. Could you share with us some interesting stories from your encounters with legendary artists Andy Warhol, Jean-Michel Basquiat, Julian Schnabel, Francesco Clemente and Jeff Koons? For the birth of my first son, Marc, we asked Andy to do a portrait of myself holding Marc in my arms. I went to the Factory, had my Polaroid done and waited for the call. When I arrived to see the painting, I was disappointed as I had my lip closed and looked very strict. I’m a smiling and laughing person, and as I did this portrait for my son, I wanted him to see me smiling! So I took my courage and talked to Andy about it. He was a bit surprised to start with (as he was already a superstar), but he said “ok, I’ll see what we can do, We’ll call you”. He then called and I went to the Factory! He was so surprised of my first reaction that he finally made 3 different portraits of Marc and myself and gave me all three of them! I was so thrilled about it and love them! Jean-Michel was always cracking dirty jokes and I used to cry from laughing; that’s why I got “your teeth” drawn with a marker on a dinner napkin from him, which I still keep preciously! The collection being recognised with a first prize by The Swiss Institute of New York. Why has art become important in your life? I couldn’t live without being surrounded by art. It gives me enormous joy! Mathieu Malouf, Jana Euler and Tobias Madison. What are you especially excited about in regard to art in 2016? Looking forward to see Art Basel! Even after over 30 years, it is still super exciting to discover new talents! 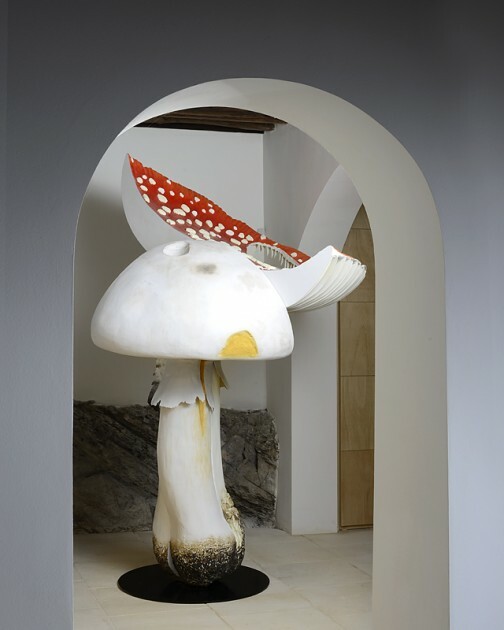 Carsten Höller, Giant Triple Mushroom, 2010. Photo: Philippe Fragnière. Courtesy of Suzanne Syz. Do you find any particular link between the art you collect and the jewelry you design? If yes, what is that? Art inspires me for my designs. Who in the art world inspires you the most for your jewelry design? What do you think are the commonalities between artists and jewelry designers? Would you consider yourself actually as an artist? No matter which artist or designer in particular, creative people are inspired by different things or happenings in their lives and translate that into their art! 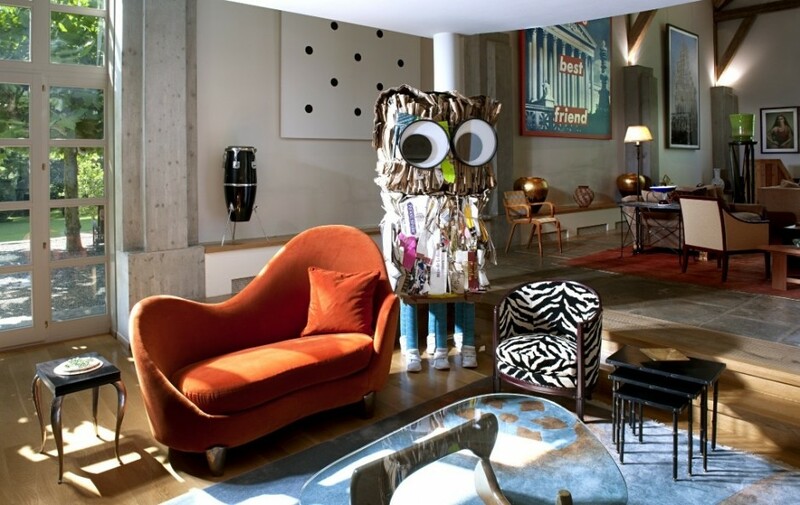 The Syz residence in Geneva, including artworks by Barbara Kruger, John Armleder and Rob Pruitt. The Syz Collection.